Hayley and the gang are starting a Riot! "My voice is an instrument," says Hayley Williams, the 19-year-old red-(and sometime blonde, and sometimes orange) haired siren who fronts the Tennessee-based punk-pop band Paramore. "I use it like any other musician. The only problem is, I can't go out and buy new strings all the time." Like her tight (and now tightly-knit, after several member changes) band, Williams is quite a little bundle, alluring in an understated way, and blessed with a voice that can go from pixie to panther at the drop of a rim shot. Since hooking up with guitarist and co-writer Zac Farro, things have happened quickly for Williams and her Paramore mates. 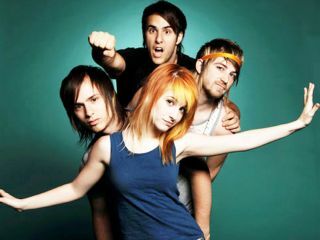 Their major-label debut, Riot!, powered by the frenetic singles Misery Business, Crushcrushcrush and That's What You Get, went platinum in the US, gold in the UK, and in numerous music magazines the band was named "No. 1 Group To Watch" and variations thereof (oh, and Williams was routinely named "Sexiest New Female") - pretty heady stuff for kids just shy of drinking age. "I feel like we're on a bullet train right now," says Williams. "We've staked our claim, but now the real test is if we can go the distance and be a band for the ages. We want to expand out of this little musical box we're in and really make music that hits everybody. It's something I've always dreamed of, and it's starting to happen. We'll see if this next record (the band is currently writing and tossing around producers names) can do it."